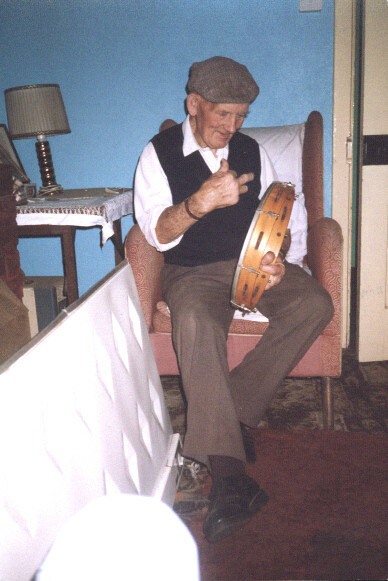 Many families have played traditional music since the end of the 19th Century in the parish of Peterswell. 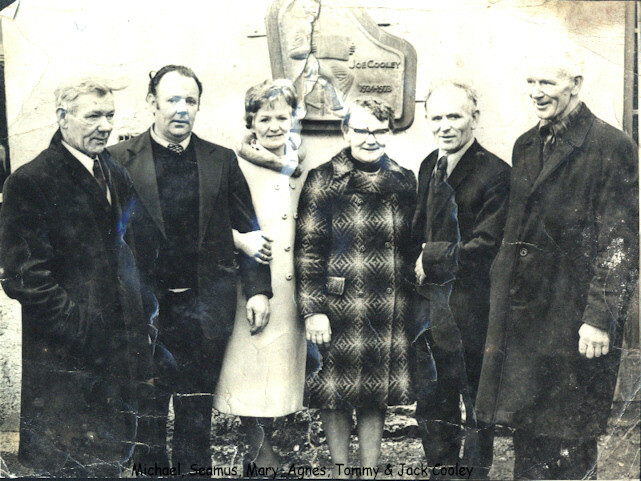 The most notable of these were Mike and Tommy Collins of Knockoura. They played tin whistles and their sister Bridget (Biddy) sang. John, Chris and Kathleen Collins of Cappard learned their music from Jack Mulcair. Nora Cooley, Licknabegga, played concertina and her family, Jack, Joe, Mick, Agnes and Seamus, would have learned from her. Kate Fahey, Knockoura, played melodeon and Jimmy Fahy and Pat Kennedy, Calfhill, played the accordion. 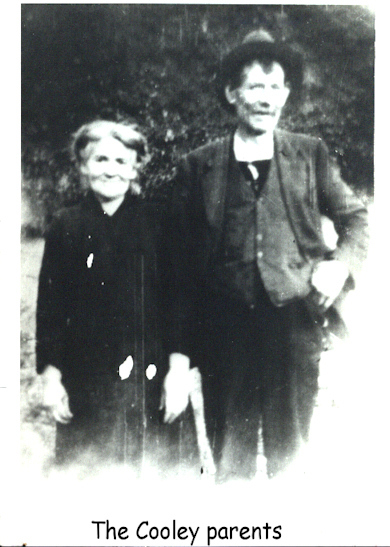 Ellen Mulkerrins, Ballinabucky (aunt to Bridget Sherry) played melodeon. Her children, Eddie played mouth organ and Fr Tom and Gretta played fiddles taught to them by Jack Mulcair. When Fr. Tom was a prisoner in Korea he whistled the tunes to keep sane. Today his nephew Tom Mulkern carries on that family tradition. Jack Mulcair of Kiltartan and Crusheen Co. Clare taught music to children and adults in schools, halls and private houses. He cycled over south and east Galway and north Clare imparting his knowledge to his pupils. In Peterswell village school some of his students included Josie Cooney, John Moloney, Ciaran Moylan, John Willie and Kathleen Fitzgerald, Josie Diviney, Bridget and Sr. Mary Farrell, John, Kathleen and Chris Collins, Molly Farrell and Eileen Cooney. See photograph of 28 people taken in the mid-1920s at Peterswell N.S. 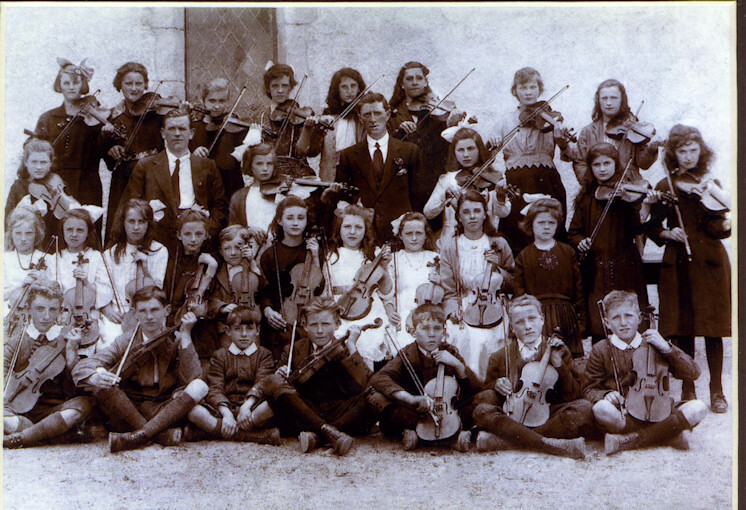 all with fiddles.This teacher is J. O’Meara This reflects (i) the importance of passing on our culture to the next generation and (ii) even though money was scarce, the community thought it was worthwhile to invest it in musical instruments. A Ceili Band was formed in Peterswell in the late 40s. The regular members were: John Moloney, Josie Cooney, Johnny Keane, Jack, Joe and Seamus Cooley, Teresa Gardiner, Kathleen Collins (Skehana), Joe Leary and Kit O’Connor. The band played for the Hop-Dances in the hall and many musicians used to drop in and play a few tunes with them. Milo Mullins, Mongan Murray, Tess Sheehan (Ryan), Martin Niland, Joe Burke, Kieran Collins, Peter Gardiner are some of those. Kathleen Collins(Skehana), Babe Keane and Paddy Keeley (Raheely) danced the three-hand fling. Paddy also danced the brush-dance, sang, did recitations and was a very fine actor. Joe Cooley worked and played with Joe Leary and Charlie, Johnny and Kevin Doyle and Joe Howley in Clare and in Dublin. Joe Cooley played with the Galway Rovers Ceilí Band in Dublin. Paddy Burke and Sonny Mullins from Gort played with the Cooley’s for house parties all over south Galway and Clare. Joe and Seamus Cooley played with the Tulla Ceilí Band until they emigrated to London and the U.S.A.
Joe went to San Francisco where he taught music to many young people of whom Patricia Connelly was one. Joe and Seamus played with many fine musicians all over America until they finally settled in Chicago. When the Cooleys returned home on holidays many musicians came to Sherry’s and Lahiff’s pubs to have a tune with them, notably Joe Burke, Barney McKenna (The Dubliners), Tony McMahon, Micko Russell and Dr. Bill Loughnane to name but a few. Due to ill health, Joe Cooley and his wife Nancy (McMahon) returned home for good in 1972. For the next 18 months Joe played with Des Mulcair (son of Jack, Crusheen) all over south Galway and north Clare until his untimely death on 23rd December 1973, aged only 49 years. Ironically the last place Joe Cooley played music was in Peterswell Hall with his long-time friend Dr. Bill Loughnane. Thosaigh sé agus chríochnaigh sé ina áit dhúchais. Ciaráin MacMathuna recorded Joe and Seamus Cooley. Tony McMahon and Cathal O’Shannon made a brief film for R.T.E. on November 29th 1973 in Lahiff’s Pub, Peterswell. Kieran Collins learned his music from his mother Maggie, who played the concertina, and later from the Cooleys. Kieran also worked in London and was very prominent in the Irish music scene there. He returned to Dublin and was recorded for R.T.E. by Ciarán MacMathuna. He also died in his mid-40s, in November 1983. Growing up in the 50’s and 60’s, there were a lot of house dances and American wakes in our parish, Jimmy and Eddie Fahy’s, Pat and Mattie Kennedy’s, Pake Keane’s and at Agnes Carew’s (Cooley) house in Hollymount. Agnes taught us to dance the South Galway Set, the Brush Dance, the Fling and The Waltz to music of the old 78 records, played on the wind-up gramophone. Traditional music has a very emotional effect on some people, none more so than immigrants who on hearing the music of their homeland has the effect of compounding their homesickness, especially for some who knew they would never return home again. On the October Bank Holiday weekend, for the past 20 years, The Cooley-Collins Traditional Music Festival is held in Peterswell-Gort. This Festival endeavours to keep the music alive for many years to come. Brendan Mulhaire (Galway City) taught music in Peterswell in the 60’s. Karina Cahill, Coole Gort, (daughter of Rosaleen Glynn, Ballylee) has been teaching music for a number of years in south Galway. At present, Eilish Mannion is the music teacher in Peterswell, continuing the tradition started by Jack Mulcair over 80 years ago. Long may this tradition of passing on our heritage continue for generations to come.